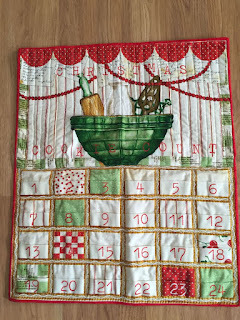 52 Quilts in 52 Weeks: January UFO Parade: Happy New Year! Can you believe we've been challenging ourselves to finish UFOs for three years? One would think we would have them all finished by now -- but somehow, they keep multiplying! Here are the finishes for December. Scroll all the way down for the 2016 UFO Challenge! But first, I have to apologize to Martha in Boise. She sent in a finish for the December parade, and I lost it in my email inbox! I promised to update the post, and didn't get that done, either! So here is Martha's quilt -- which I love love love! I think it's flannel -- and didn't she do a great job with that narrow sashing? Thanks, Martha, and I apologize again. Kamikaze top finished in July so I was ahead of schedule on this one. It is a Bonnie Hunter design called Midnight Flight from her book More Adventures with Leaders and Enders. 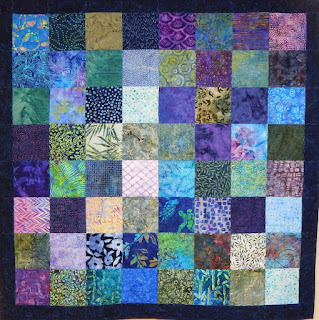 Unit 1 and Unit 2 were made through a swap I coordinated that ended in November 2014 where 14 quilters participated. I ended up with lots of bonus triangles in neutral/blue and neutral/purple with it that I was able to use in November's 2015 UFO that I called Komatose... Getting side tracked.... The name Kamikaze was inspired from Swooze one of my blog followers. I do get stumped at times coming up with an appropriate "K" project names. Love it when my blog friends help me out. Kamikaze finished at a whopping 82" x 82". I really like how the black and white check set that's the inner border worked out. 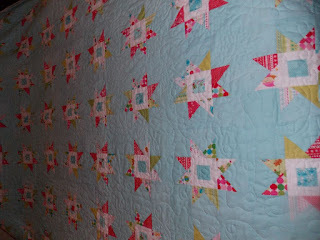 Here is a link to my blog talking more about Kamikaze's finish. And if you want to read about the rest of Sandi's 2015 finishes, go to KwiltnKats, here. Irene has two finishes this month. First is for some friends who enjoy hunting and have a place to stay in the woods. 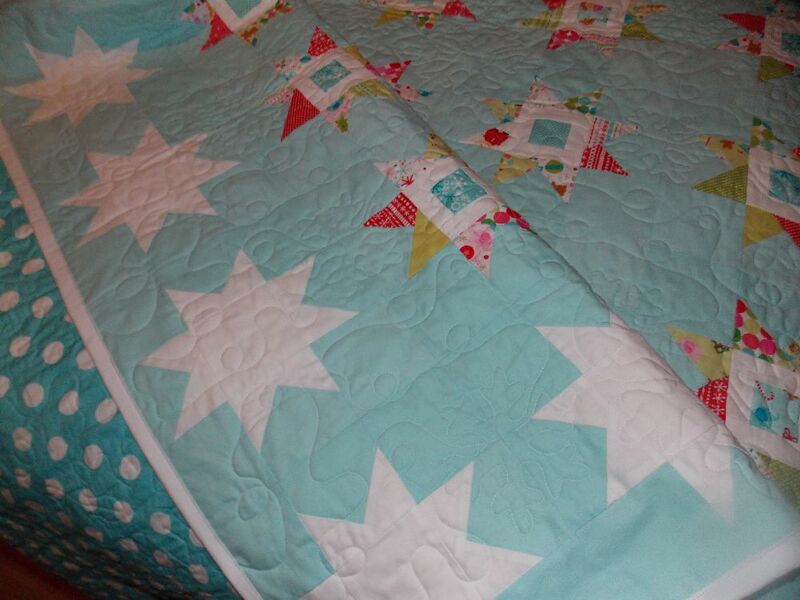 That quilt looks to be made with flannel -- perfect for snugging up in front of a cozy fire! The second one is truly a UFO. 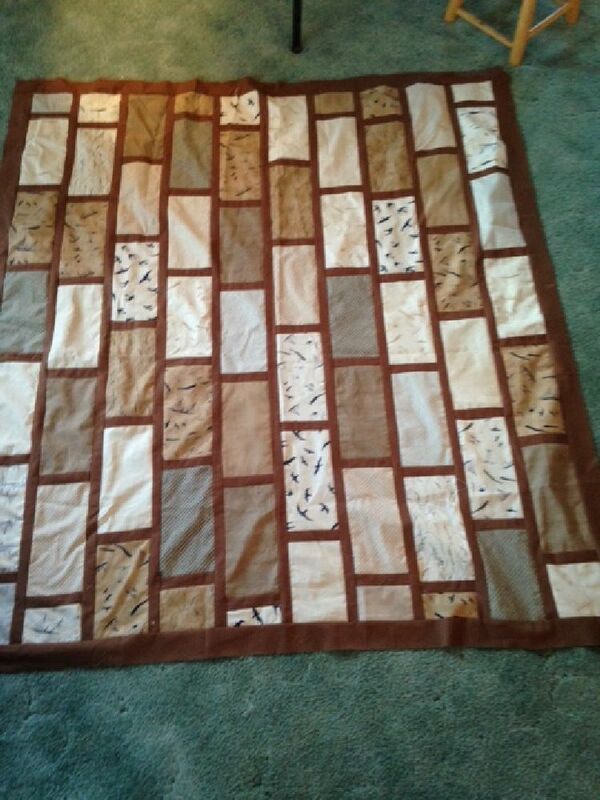 I made the top years ago as an autograph quilt, but it was so long ago I do not know who was supposed to receive it. However, we have friends who are leaving the area and she taught the high school Bible class at our church. 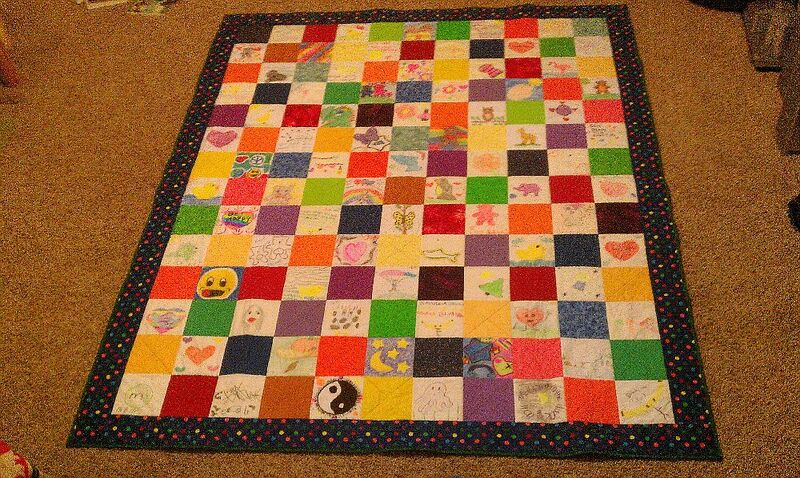 The class wanted to do something special for her, so this quilt is now signed, quilted, and has found its home. Mary J made good use of a few days off from work to bind four quilts! 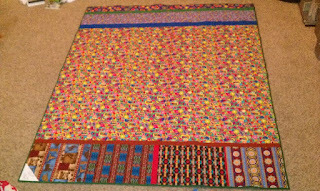 Here are photos of two of them, and you can read more on her blog, Zippy Quilts, here and here. 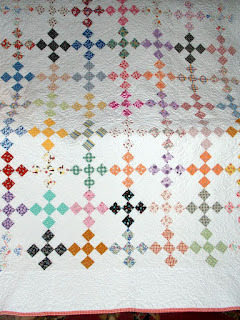 Click on the photos for a close-up of the great quilting! 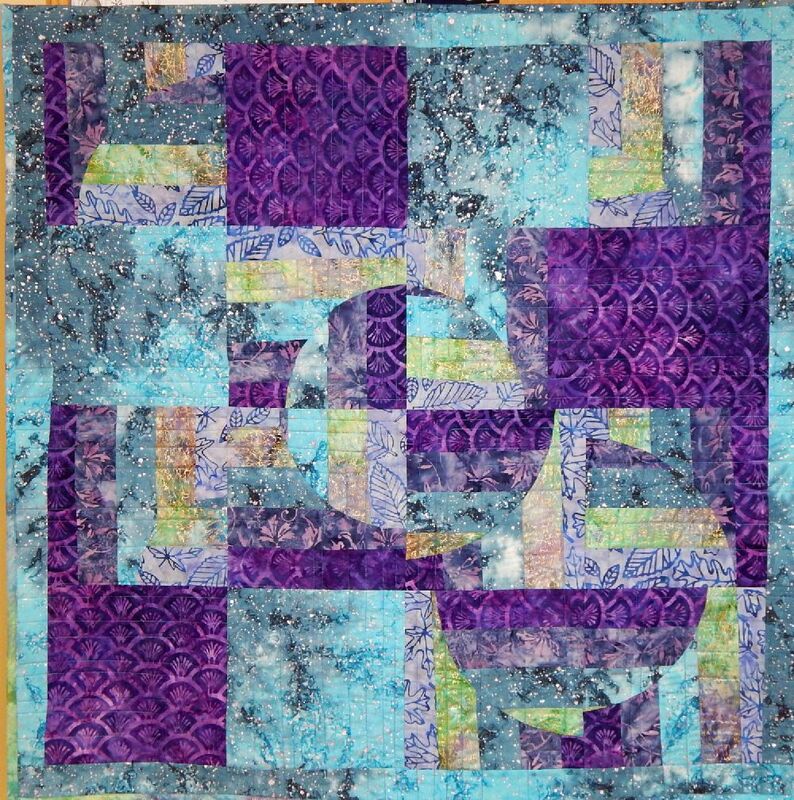 Jill had a busy quilting month in December. Look at all these finishes! 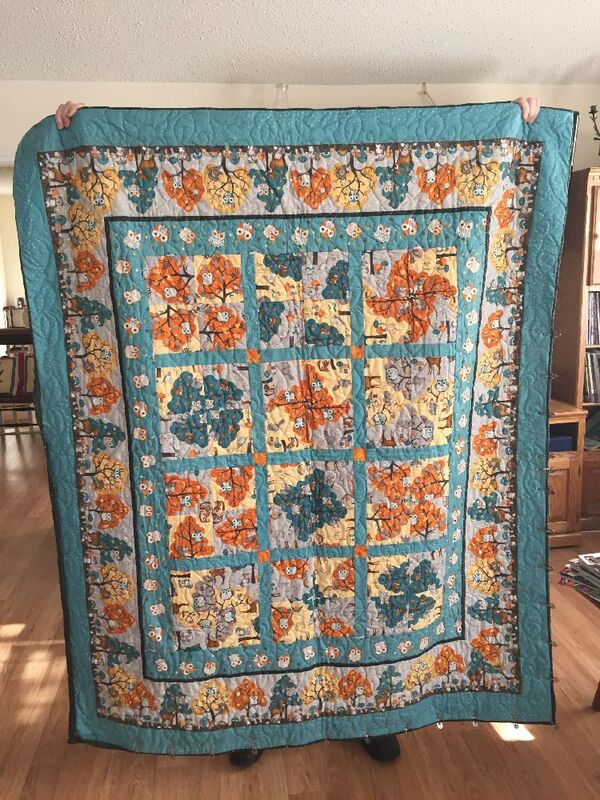 First up is a king-size quilt -- finishes at 100" square! 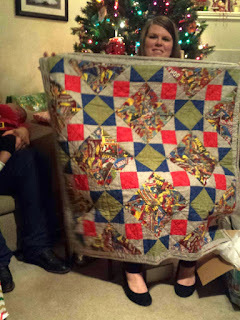 The first quilt is a scrappy quilt I finished for my son and his wife. I believe it was a tutorial at one point called scrappy summer. Their anniversary quilt was not really meant for cuddling, figured it was better to give two than torture them! The second was a Christmas gift for my sister. 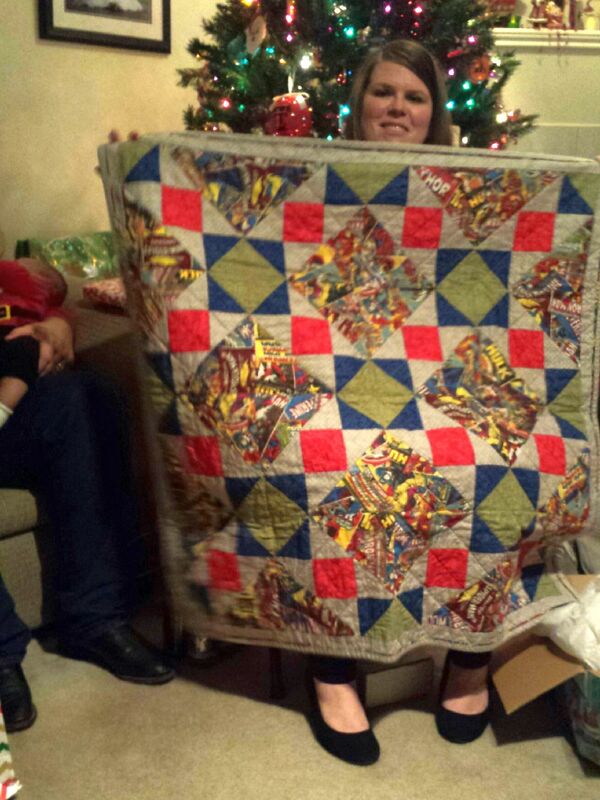 Her first quilt made by me. She was so excited! Number 3. Well that is a very special quilt. My son was in Iraq when my mother passed away, 8 years ago. I realized I didn't have anything made by my mother and I didn't want my kids to have the same. So I started 5 wedding quilts. At the time Kodey assured me he was never getting married. He was married the next Christmas Eve. So I figured I would finish for their first anniversary. Their 5th anniversary. How about the 7th?? 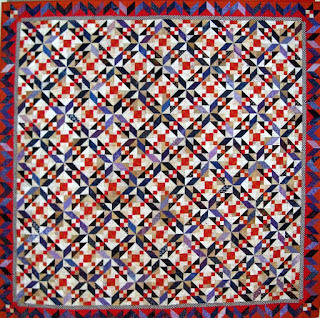 ?lol There is a lot of meaning in this quilt. There are 56 blocks, 52 which are all different and the 4 corners are all the same. Each of our 4 boys will have different blocks for their corners, they were child based. Kodey's have 'I love You', since he was the kid that always seemed to need to hear it the most. 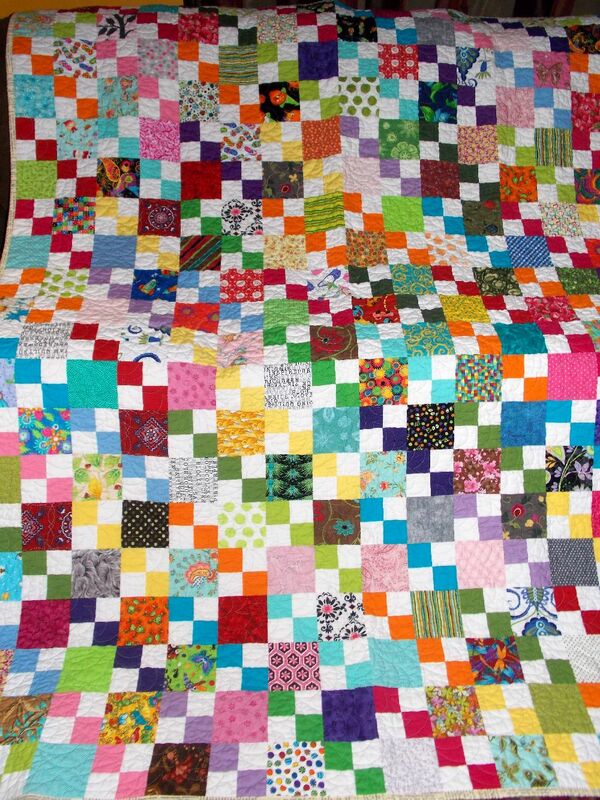 The block in the center is made from a pillow case they gave my mom on her last hospital stay. 52 different weeks, 4 corners to ground you and everything revolves around family. I choose 1930's fabrics because it was an era of making do. You worked with what you have, as it often is with marriage/life. This was all put into a letter, which I should have attached tissues to. I have 4 more of these to go, one has to be done by May. Jill says she had a very productive month -- I'll say! And I also hope it continues into 2016! Becky has a fun finish for this month, with a great story behind it. For several years I was a religious volunteer on the Girls Youth unit at the Utah State Hospital. Once a week we had an activity night with the girls and we tried to have a service related activity at least once a month. 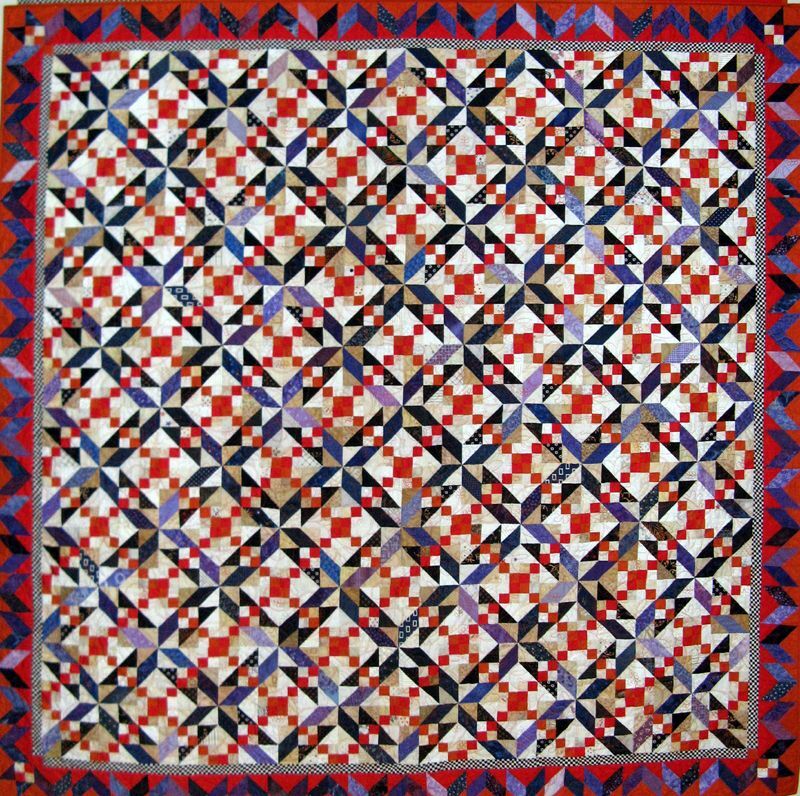 One of their favorites was coloring quilt blocks for wall hangings and quilts that would be donated locally. 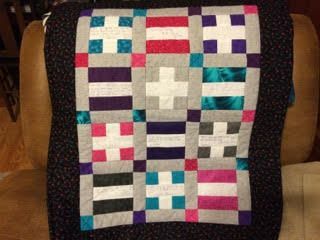 I finally got my last stack of blocks turned into a twin size quilt to be donated to the local transitional housing shelter to help people recover from homelessness. I love the back almost as much as the front. I had a bright hippie print that I wanted to use for the backing, but I didn't have quite enough of it. A row of fat quarters I didn't know what to do with across the bottom and a couple of novelty prints with solid spacer strips across the top solved that problem! I think it looks much more interesting than if there had been enough of the hippie print. 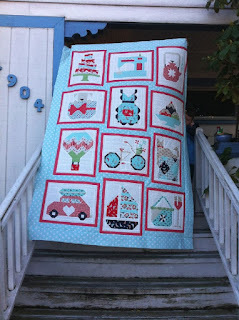 Betsy has two baby quilts to share -- she says they weren't on her original UFO list -- but of course, they still count! She also learned to knit this year, and made herself a sweater. Good on you, Betsy! Let me know if you want to knit Hats for Sailors! I decided that this year was the year I would get the Reflections quilts done. I worked on the blocks on and off most of the year. I rearranged my UFO numbers when it came up to soon in the year. Then I hit November....no choice now. I started sewing blocks again. I got close. I finally got all the blocks made after Thanksgiving. 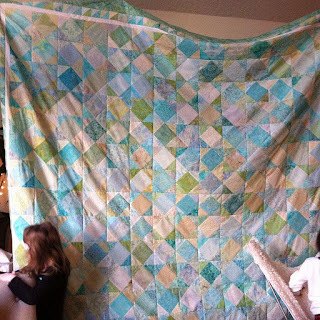 The second weekend in December, I got the first quilt laid out. My daughter hurt her back and so I ended up taking care of grandkids one weekend. And sewed a row every night after work. By the weekend before Christmas I had the center together. I got the first boarder on and started ironing the half square triangles for the second boarder. 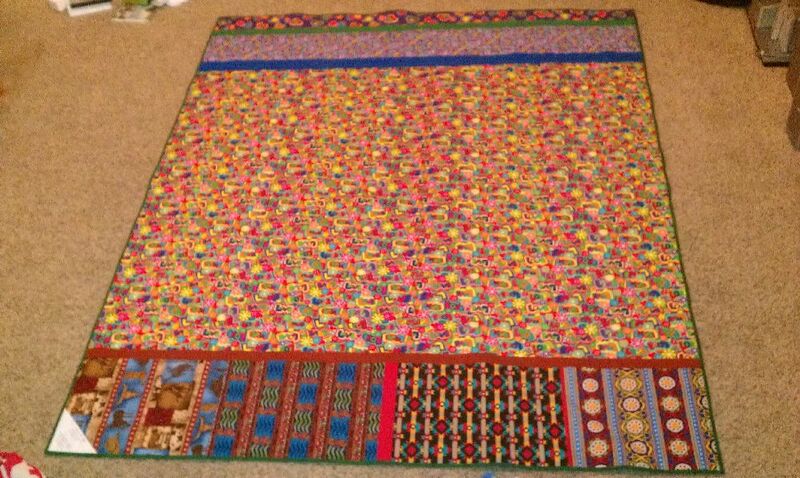 Those were all done by the 24th and I almost got all the boarders sewn together after church on Christmas Eve. The next morning I started sewing at 6:30am and got the second boarders on by about 11am with breaks to cook a ham and make other food for the day and finish wrapping presents. Third boarder was on by 12:30. Ham out of the oven at that time and started loading stuff in the car. Here is a couple of pictures at my daughters house after she opened the gift. Both girls are standing on the couch to hold it up. It is huge. And gorgeous, Nancy! I love those colors -- well worth the time it took to finish! 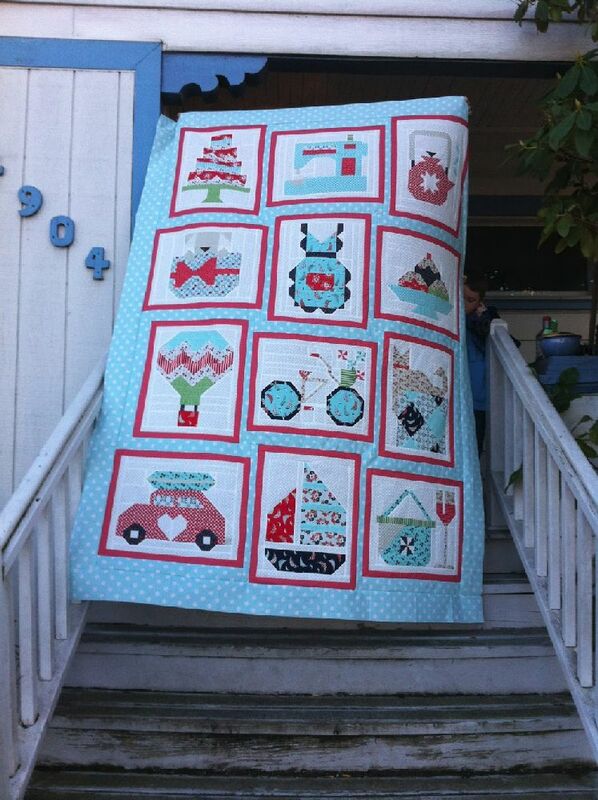 Nancy also finished her Fat Quarter Shop Snapshot quilt. She says "I did not want it to become a UFO for next year." Joy has two lovely finishes for the last minute! 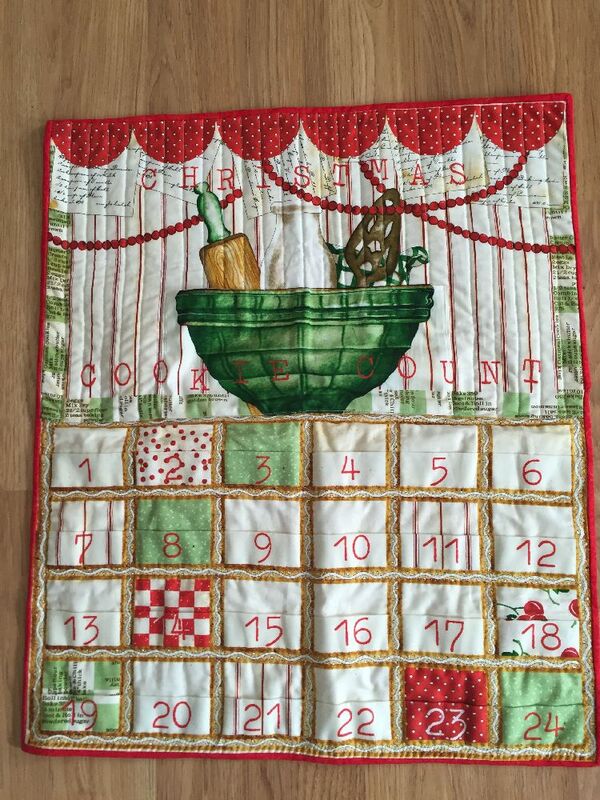 The first is an advent calendar. Joy says it wasn't finished in time for this year -- but she'll be ready for next year! 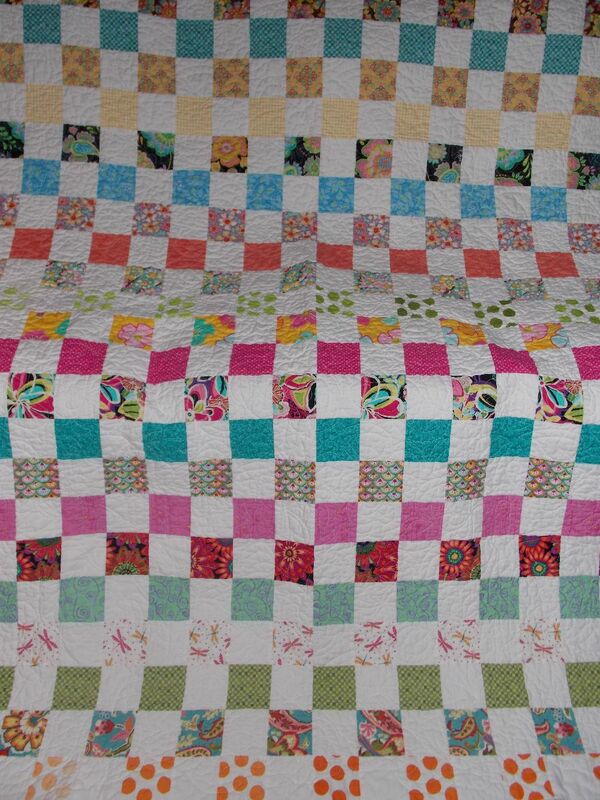 The second is a quilt I made as a shop sample. 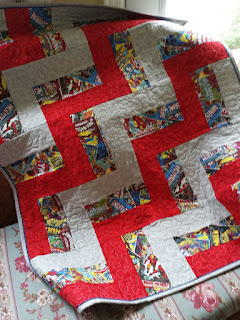 It took me a week to put it together, and 7 weeks at the long arm quilter. By the time it got back to te shop, we had already sold most of the fabric and didn't need the sample. So I took it home to bind. Since out shop owner prefers bias binding, I did my first bias binding. I am spending New Year's Eve stitching it down. It will be done by midnight! Since we didn't need it at the shop, I have bought it to give to my son's first grade teacher. She loves owls! That's an impressive collection of finishes for December! I can't wait to see what you all do next year! We're changing things up a bit for 2016. Yes, there will still be numbers drawn and posted each month. But there will also be two "free" months. January is the month to work on your favorite UFO (mine is Ryokan!). And in honor of the sports fans among us, December will be a "bye" month -- you can choose to finish a UFO or just sit back and relax. 1. Pull out 10 of your UFOs. (Notice I didn't say all your UFOs. I know you have at least 10!) These can be half-done projects, barely begun projects, or even quilt "kits." 3. Number each bag 1 - 10. 4. Come to 52 Quilts the morning of the first day of each month and I will have posted the number for that month's project. 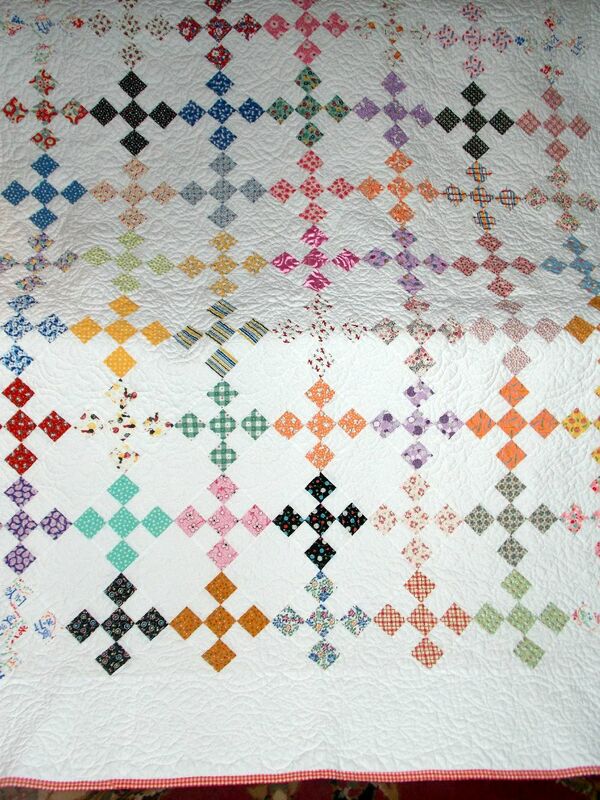 Remember, at 52 Quilts, you decide what is "finished." Is the piecing finished? Are the blocks sewn together? 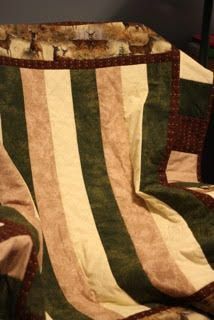 Or do you consider "finished" to be "quilted, bound, and ready to give away?" 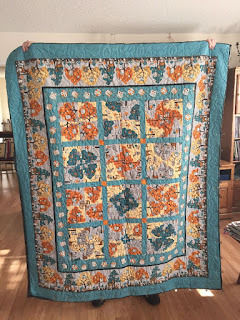 When you've finished your quilt, take a photo and email it to me at AuntMarti at 52Quilts dot com. Speaking of UFOs -- my co-editor says he can't finish the UFO Challenge button and blog page makeover until he returns to Japan and his fancy-schmancy computer! I love your idea of doing 10 UFOs this year, since I only finished 6 last year!! My heart is still with this group however. Oh that is a really good plan!. I like it. I have already started my second Reflections quilt for my other daughter. 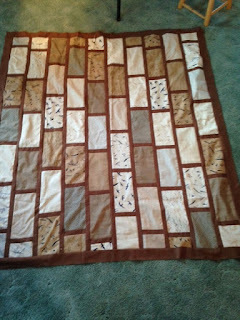 The other good news is I got the back done for my Snapshot quilt yesterday. I love this idea. I am going to pull 10 UFO's today. Thanks Marti. 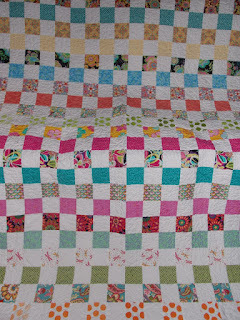 Love having the incentive to finish my quilts! Great stories behind all the finishers too. SO hard pick my favourite this month - maybe the "HUGE" one - for the colours especially. Great that I only need to finish 10 this year - I hope to be a regular contributor again..and I could find 10 to finish off . Happy New Year Marti to you and your boys. In my usual style I am five days late in checking in to see what everyone got up to so I'm already behind for this year! hehehe What an amazing group of finishes, everyone did so well at such a busy time of the year although I have to wonder if any of us would finish anything if it wasn't for 'the last minute'! Loved the story of Jill's quilts for her children and true dedication by Nancy to get that top done on Christmas Day - impressive. Here's to a successful 2016 of UFO finishing!